All your critical information in one convenient wrap! Developed and designed by actual paramedics and vehicle recovery specialists to prevent precious time from being wasted trying to identify each patient and determine their medical history. A Rescue Facts™ wrap on every seat belt in every vehicle will minimize the initial confusion associated with traumatic incidents, and save lives everyday. People involved in an emergency situation are often suffering a high degree of stress and confusion. They may not even be conscious! But you need to get the facts quickly. Without good medical information you must be more conservative in your on-scene treatment. Having this current medical information with your patient allows you to help them even when they can't speak for themselves. We'll be travelling with my profoundly handicapped daughter to Disneyland in Paris so the seat belt strap is just what we need to ensure rescue personnel can access details on her complex medical and caring needs (she is tube fed and must have her feed at specific times). Another important detail [that I can communicate with Rescue Facts] is that although she is non-verbal and comes from Denmark, she understands English perfectly. Wallets and purses can be difficult for emergency personnel to find during an accident. Paramedics and police can waste precious time searching for the information they need to make critical treatment decisions. ID bracelets and tags carry only limited information. But the Rescue Facts™ Identification wrap is no ordinary ID tag or bracelet. It is right where first responders will look first! The secure nylon and velcro pouch holds important documents that provide rescuers with complete identification and contact information, medical history and consent-to-treat forms (including parental consent forms for minors). 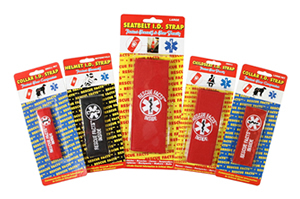 Rescue Facts™ wraps come in a variety of sizes, for a variety of uses. Use it anywhere that you need your information found quickly and easily by emergency personnel. 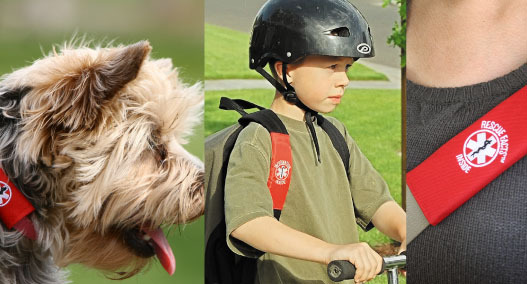 For children and pets, provide contact and consent-to-treat forms. 30 Day Money Back Guarantee! We're so confident you'll love Rescue Facts that if you're not completely satisfied within 30 days, send it back to us and we'll refund the full purchase price (less P&H). Simply contact us at 1-805-380-4066 and we will be happy to assist you. Upon PayPal checkout, simply enter your loved one's SHIPPING ADDRESS and we'll gladly ship the order directly to them! Call or order online. Please contact us at 1-805-380-4066 and we will be happy to assist you. Rescue Facts™. All rights reserved. Copyright © MMXIV. Website Design for Southern California.